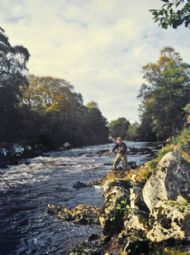 The Kildermorie Estate beat extends for approximately 0.8 miles (1.3 km) downstream from the confluence with the Blackwater tributary. Fishing is from the left bank only (the right bank being owned by Novar), and access is via the forestry track off the Strathrusdale road. 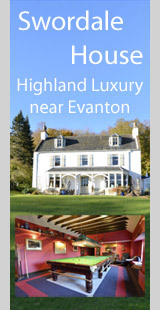 Kildermorie Estate purchased the beat in 2006. It had previously been referred to as the 'Burns Water', and had been under the control of Alness Angling Club. 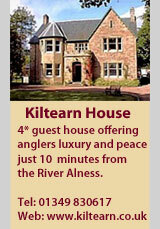 The fishings are now offered exclusively to guests of Kildermorie Estate and Alness Angling Club members. Up to 6 club members may fish the beat at any one time. Fly fishing and worming are permitted. The 5-year average for this beat is 27 salmon & grilse. 30 fish were caught in 2015, of which 16 were returned (60%).